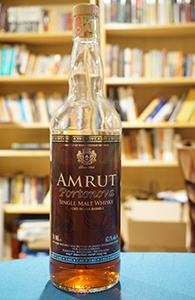 This first batch of Amrut’s Portonova was released in 2011 and I purchased my bottle in early 2012. I have no idea why I’ve waited so long to open it. Well, open it I finally have and it was on the occasion of a vertical tasting of a number of Amrut I held for a few friends in town earlier this month. We drank three single casks along with it: a bourbon cask, a sherry cask and a peated port cask. The Portonova was third in the sequence but I think it was the consensus, and perhaps even the unanimous favourite on the night. I’m not always a fan of port cask whisky, and generally the ones I’ve liked most have been peated in the bargain, but on the night I really liked it. Indeed, I thought this might have been the best port cask whisky I’ve had to date—I certainly liked it more than the peated single cask. Let’s see if I like it as much tonight when I have more time to give to it for a formal review. This is not full-term matured in port casks/pipes, by the way. It’s made the same way as their Intermediate Sherry. It starts out in bourbon casks then goes into port casks for a brief while and then goes back into bourbon casks for a final marrying. Portonova is a better name than Intermediate Port, I guess. Nose: Closed at first. Then a hint of rubber followed quickly by a nutty, raisiny note. Right below that is the expected red fruit: cherry liqueur and plum jam; the powdered ginger I usually get from Amrut is mixed in with the red fruit notes, keeping them from getting cloying. Some nice polished wood as well. After a couple of minutes it’s somewhat cough syrupy but in a good way, if such a thing is possible. The wood gets a little dusty after a bit and the whole gets a little drier. Water pushes the red fruit back and makes it all much mellower; some apricot now along with orange peel and a bit of toffee; a minute or so later some sweet pipe tobacco as well. Palate: Hot but not unapproachable: the fruit is all very tightly rolled up together, however, with a generic sweetness followed by an indistinct acidity. Drinkable but needs water. Well, let’s give it a bit more time first: 15-20 minutes in it begins to open up with cinnamon and plum and some lime, but it’s time for water. Ah yes, here’s the fruit: much more citrus now than red fruit (though the sweetness is still around) and the cinnamon is less assertive. Finish: Long. Drying and spicy and increasingly tannic at first and then there’s the cough syrupy sweetness (along with some lime); should open up nicely with water. As on the palate with water: less tannic, less drying and far more citrus than cough syrupiness. Comments: A wonderful nose, especially with water added—very nice development. Water opens up the palate nicely too but there’s just not as much happening there (though perhaps with more or less water I might like it even more). Still, I think this may be the best port cask whisky I’ve yet had. Are the later batches as good? This entry was posted in -Whisky by Rating, 85-89 points, Amrut, Distillery and tagged *Whisky, Amrut, India, Single Malt. Bookmark the permalink. All well—just trying to give the impression of being gainfully employed. MAO, this stuff (your sample) is fantastic. Have you had other batches yet? More importantly, are they still packed in shoeboxes? The Portonova was never in the ghastly shoebox packaging, thank god.